The greatest indicator of whether a machine will work in any application is putting that machine under the stress of actual operating conditions before you buy it. Fowler Construction did just that before deciding on adding two new 320-horsepower CASE 1121F wheel loaders to its fleet, working both to load trucks with aggregate and feed the company’s asphalt plants that serve its paving operation (Fowler Construction is a repeat winner of the Canadian Ministry of Transportation’s provincial “Paver of the Year” award). Fowler Construction was founded in Bracebridge, Ontario in 1949 by Archie Fowler, Glen Coates and Ralph Boothby. With humble beginnings in the logging industry, the company expanded over the years and now offers services in road construction, aggregates and asphalt production, as well as water and sewer work, golf course and sports court construction, seasonal road maintenance and excavation, and site preparation. With more than 400 employees, Fowler is one of the largest employers in the Muskoka, Ontario area, and the company continues to accelerate the growth of the business and its commitment to ongoing improvement. Part of that improvement is adding new equipment as needed. The company went with the 320-horsepower wheel loaders with six-yard buckets because that size was optimal both for its summer pit/plant operation, and for winter snow removal and other seasonal work. One of the most important elements of the testing process was evaluating fuel consumption. The fuel savings that Genders has experienced with his 1121F wheel loader are the result of several components of the machine working together; the Selective Catalytic Reduction (SCR) engine, four operating modes that allow the operator to tailor the machine output to the application, and an industry-exclusive cooling design that requires less machine effort/fuel to operate. Using Genders’ data that the 1121F burned 15 liters/hour (3.96 gallons/hour) and the price of diesel fuel , the hourly fuel cost of the 1121F is $13.11 CAD ($10.02 USD). Other wheel loaders with double the fuel consumption could require as much as $26.22/hour CAD ($20.04 USD). Over the course of a 10-hour shift, the 1121F could provide as much as $131.10 CAD ($100.20 USD) in savings. Those savings are even greater when Fowler works a 12-hour shift – and become even more significant projected out to a fleet of 25 wheel loaders. Another great advantage of the fuel efficiency is extended runtime. With multiple aggregate sites spread across a 150-kilometer (90+ miles) region, those extended runtimes result in fewer required visits from the fuel truck. Genders also attributes some of the machine’s fuel savings to the design of its boom (Z-bar) and hydraulics, and how it attacks a pile and comes out compared to other machines. Genders has also spent significant time designing work cycles/envelopes that require the least amount of machine movement to get the job done, and right-sizing each machine to its application. 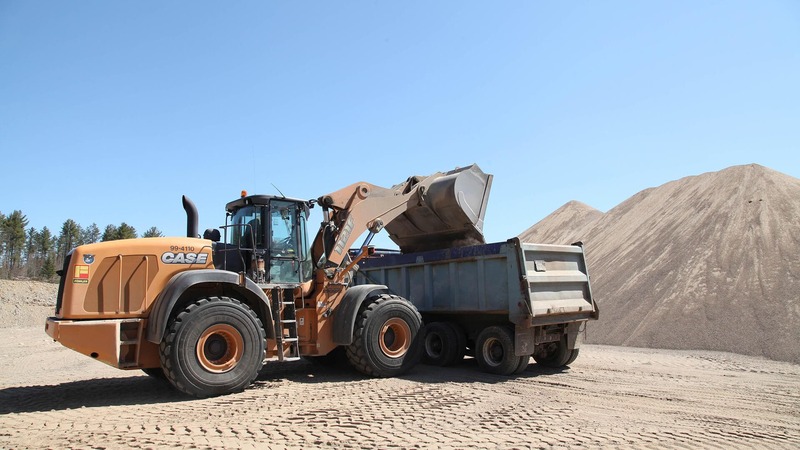 The 1121F with a six-yard bucket is an ideal match both for the truck fleets the company runs (typically filling in three passes), and the aggregate plant hoppers that the loader is charged with feeding. Weighing in at more than 60,000 pounds with a wheelbase just under 12 feet, the 1121F is also extremely stable and agile in both of its core applications. 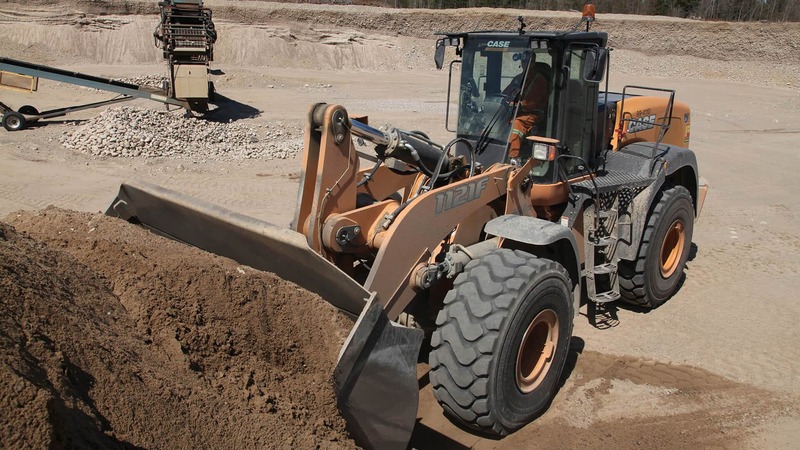 Genders’ operators report that the wheel loader provides a smooth ride – both 1121Fs are outfitted with Ride Control. Not only does this make the ride easier on the operator and help retain more material in the bucket, but it also plays an important role in the company’s weighing methods. The CASE 1121F wheel loader features a spacious cab, ergonomically designed controls and a heated air-ride seat for operator comfort. The 1121F also features the lowest and most narrow rear hood in the industry for a loader of its size, as well as a wide-angle rear-view camera for improved visibility in tight areas. With a fully electronic raised hood, environmentally safe fluid drains, sight gauges and easily accessible ground-level checkpoints, the 1121F is designed for simple maintenance. The exclusive CASE cooling cube also helps keep the engine cool while minimizing the buildup of debris during operation. 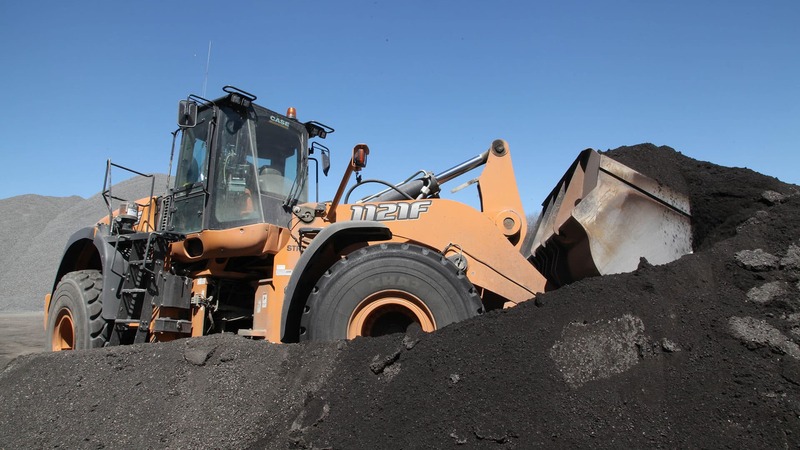 The 1121F wheel loader comes standard with CASE ProCare, —the most complete maintenance and support program in the industry, which provides a 3-year/3000-hour full-machine factory warranty, a 3-year/3000-hour planned maintenance contract, as well as a 3-year advanced SiteWatch telematics subscription. 1. Does not represent a promise of performance – every application is different. 2. Price taken from Bracebridge, Ontario on 5/31/16. 3. Not an actual price savings quoted from Fowler; uses current fuel prices and is based on a 10-hour shift.